I've not used any Thunderbolt Docks but posting for feedback from other Thunderbolt Dock/USB3 drive owners. 1- booting from an external drive with USB3 connection to a thunderbolt dock does not boot the external which has a known good OS X install. I usually try to boot either Mavericks or Yosemite. 2- installing OS X, usually I do Yosemite, does not reboot the external drive again connected by USB3 to a thunderbolt dock. So in effect the second phase of the install will never complete. I've tried mostly bus powered LaCie rugged drives. I have tried powered LaCie external USB3 drives. 2) The OS being booted to is OS X 10.9.4 or later. Thanks Guido. Some commented on your 2 WD USB3 drives performance. Both are portable drives (2.5in) and 5400rpm I'd guess? If so, even with a direct PC USB 3.0 connection they may not do much better, even empty. (Not a WD Passport HD but example USB3.0 1TB 5400rpm/8mb cache 2.5" QB scores (cache enabled) direct connected shows large file Avg of 101.9MB/sec Read, 100.1MB/sec Write (empty). And here's Guido's Dock Connected USB3 WD 1TB (713GB free) extended tests w/cache enabled for comparison - shows large file avg of 107.8MB/sec Read and 114.8MB/sec Writes.) Since your iMac doesn't have USB3 ports, not possible to compare a direct connection vs dock but if you ever test them with a direct USB3.0 connection, send the QB rates for comparison. Thanks. "...about the (USB3 HDD) tests I did with my new OWC ThunderBolt 2 Dock. Unfortunately, at home and at office I only have old iMacs with USB2 ports, so I was unable to test them with a direct USB3 connection. 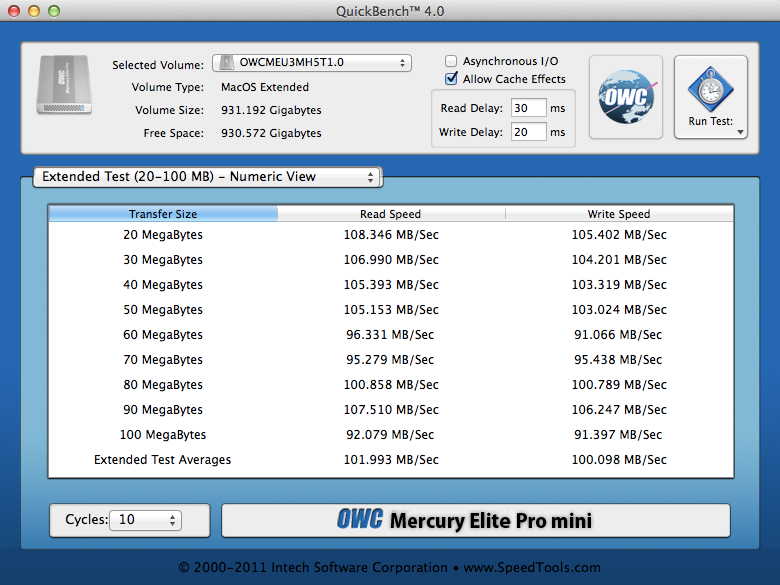 This is also the main reason I bought the OWC TB2 : to have a fast access to my new drives. I use a recent Startech TB2DOCK4KDHC dock and have had no issues booting my early 2014 and early 2013 rMBP OS X 10.9.5. (Using USB3 drive?) This dock seems to work much better than others on the market, like how they fixed the audio pop on sleep/wake and the eSata port. I used the TB1 version for near a year and had none of the issues reported by users of other docks. Its been solid for me, but I didn't try booting from a USB drive. Booting from drives in a TB enclosure was not a problem for me the few times I found the need. "I have a MacBook Pro Retina 13" (Mid 2014) and an Elgato Thunderbolt Dock (the old one, not the new Thunderbolt 2 one). I have a Samsung 840 EVO (500 GB) in an external case (ICY BOX) an am able to start from the SSD when it is attached to the dock. I have a Caldigit Thunderbolt dock (original model not current TB2 version) and a late 2013 rMBP. I have successfully booted from a number of different drives and SSDs connected to the USB3 ports of the Caldigit, including WD passport 2TB, Sandisk and Crucial SSDs on a Seagate USB3 Go-Flex adapter, Transcend Storejet enclosure, Sandisk Extreme Pro USB3 memory stick. PS: I am the one "DH" mentions in original post that can boot a late 2013 rMBP"
Are you close enough to "DH" that he could try his MBP models with your TB Dock/USB3 drives? Did NOT boot. Did NOT appear in menu of drives with option key held on boot. Tried several of the USB3 ports on the dock. LaCie Rugged USB3/Thunderbolt case with SSD (Yosemite).